There are Allegorical and Symbolic meanings hidden everywhere in existence. I would argue our role in life is kind of like a gigantic dream which we are all collectively experiencing together. The Media and our would-be masters are fascinated with putting messages and symbols in everything we see around us. Books, movies, TV shows, video games, magazines, and the story-lines in them all have a hidden meaning or allegorical message. And despite a layer of 'negative' intent, there is almost always an aspect of truth and transcendence to their messages. I was very perplexed by this truth sandwich aspect to their messages; truth mixed with social programing and hidden messages. I think it has to go back to the 'trail of bread crumbs' aspect of the old mystery schools and Rosicrucian influence in the elite societies today. Mark Passio takes the time to reveal a great deal of the hidden content in the 3 Matrix Movies. After I discovered this aspect to life on Earth, I began watching movies with a different perspective seeing the hidden messages within the films. For more information on hidden symbols and purpose check this post DISCLOSURE: DARPA Reveals Mass Mind Control Project using EM fields and Hidden symbols. 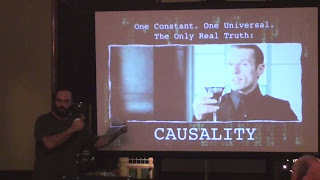 "The Matrix Trilogy Decoded" by Mark Passio was recorded on September 15, 2012. In this video Mark Passio breaks down the hidden meaning of the "The Matrix" movies. It would serve you better if you watched all three movies before and/or after watching this video. This event was held as a fundraiser for the "Free Your Mind 2 Conference" coming up in April of 2013 in Philadelphia. It is a three-day conference featuring top-calibre whistle-blowers from across the country who will shed light upon our world's problems and bring forward empowering solutions. This unique event will build upon the success of the first "Free Your Mind Conference" in 2011, with a continued focus to spread awareness on the topics of consciousness, mind control, subversive occult influences, holistic body-mind-spirit health, and solution-oriented approaches to the problems humanity faces in these challenging times. If you can make it to the conference please buy tickets ahead of time because tickets are limited. If you can't attend but would like to help support this conference please make a donation by sending an email to Donations@FreeYourMindConference.com. This video was produced by "Signs of the Time" media. The Truth Will out! But will you see it? American Kabuki: The Real False Flag? BANKSTERS GOING TO JAIL "The Week Review"
RTS: "You Are Being Deceived"